Abdominal separation is caused by ‘looseness’ or laxity of the midline linea alba, a fibrous structure that separates the six-pack rectus abdominus muscles. It causes separation of this pair of muscles, called ‘rectus muscle divarication’. Although many women with it don’t suffer any symptoms, some may experience feelings of bloating, lower back pain and loss of core strength. Following childbirth, many women describe a lack of confidence with the appearance of their lower abdomen and the inability, in-spite of intensive training and coaching, to return to their pre-pregnancy physique. Importantly, rectus muscle divarication by itself is not the same as a true hernia (in which a defect in the tissue layers exists) and therefore is not associated with strangulation (where the blood supply to a section of organ or tissue trapped in the hernia becomes cut off), although in many circumstances there is also an umbilical hernia (painless lump in or near the belly button). 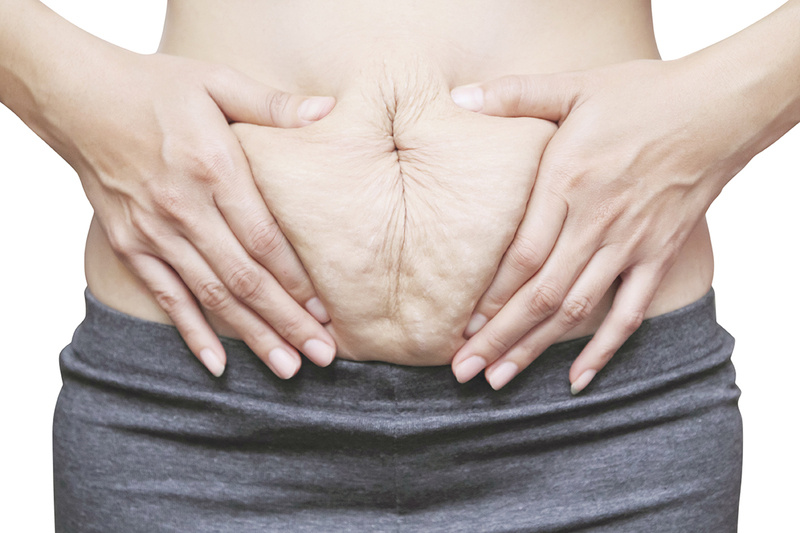 In relation to pregnancy, there is a significant relationship between pregnancies and rectus muscle divarication, resulting in ‘the post-pregnancy belly’ (1). Rates in women who have had multiple pregnancies range between 34.9% (2) and 59% (1). A study that followed women post childbirth using ultrasound showed that muscle separation remains significantly larger when compared to matched controls (women who have not undergone childbirth) at 6 months (3). In addition, abdominal strength and endurance measurements were lower in women following childbirth than those in the matched controls (3). Any condition associated with increased intra-abdominal pressure can result in weakening of the linea alba, ultimately leading to rectus muscle divarication. Other than weight gain during pregnancy and also twin pregnancies, obesity is therefore a risk factor as well as previous abdominal surgery (4). Is it only post-pregnancy women who develop it? No! Men can also suffer from this condition although it tends to occur later in life and maybe confounded by obesity and congenital mis-insertion of the rectus muscles (8% of cases) (5). The classic sign is a midline bulge spanning the entire length of the abdomen from the ribcage to the pelvis, appearing when patients tense their abdominal muscles when rising from a lying position. How much downtime is necessary following surgery? Surgical repair using a combination of rectus abdominus plication and placement of an inlay mesh to reinforce the muscle repair is carried out using a bikini line incision. Patients undergoing this type of treatment should be back to a reasonable level of activity by three weeks. Most importantly, patients are asked to refrain from carrying heavy objects for a minimum of six weeks. Early complications include wound-healing issues in heavier patients as well as post-operative build-up of fluid in the surgical cavity Occasionally if the divarication stretches the belly button converting it from being inward facing to being outward facing, the blood supply can be compromised which can affect the eventual appearance of the belly button. Late complications such as recurrence are rare. What is the long-term effect of surgery? The best time is usually 6-12 months following childbirth once the changes of the soft tissues during pregnancy have settled. It makes sense also for patients to have completed their family due to the risk of recurrence, although this is a relative contraindication only.